Naughty Brewing is a brewing company from San Antonio that is contract brewed by Adelbert’s Brewery in Austin, TX. Last October, we were introduced to two beers from Naughty before they were commercially available, as they had a free beer giveaway locally at Big Hops Growler Station. They brought in two kegs, one for I Think She Hung the Moon, and the other was a Belgian IPA called Zijden Kousen, which is Dutch for Silk Stockings (More on this beer later). I was one of the lucky ones there to try these beers. Both beers were good. 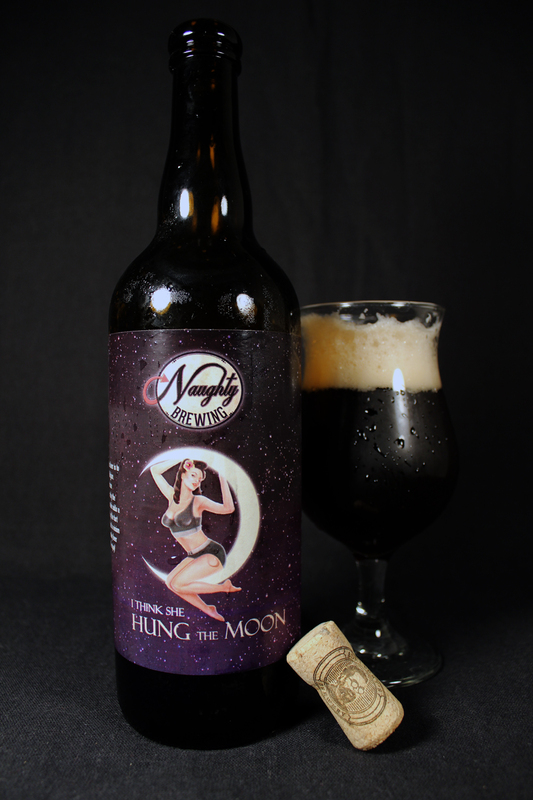 A couple of months later, Naughty beers saw a commercial release with bottles and kegs of I Think She Hung the Moon, which is a smokey saison. I love saison beers, and I was really intrigued by this beer from the get-go, as Naughty owner, James Vaello described this beer to me at the taste testing for their product. I used the recommended glassware, a tulip glass for this drink. Hung the Moon poured a nice dark caramel brown color. Even with a soft pour, this beer produced a very large tan colored foamy head at least 2.5 inches thick. Saisons are usually not this dark, so right away I was thrown a curve ball with the appearance of this beer. The aroma is pretty complex. As promised, this beer delivers a smoky aroma right away, that is quickly followed by sweet sugar. The nose also has smells of caramel, dark fruits, biscuit bread, a slight hibiscus tartness, and a very low normal saison fruity aroma. The taste is somewhat like the aroma. All the same characters are there, but for me, they appear in a different order. The smokiness is there, but not as strong as the aroma. The smoke takes a backseat to the flavors of the candy sugar and the Mexican piloncillo sugar cones. I pick up the sweet sugar right away as soon as the beer hits my palate. Faintly, I can pick up on the dark fruit notes, and the pecan smoke that is layered behind the sweet sugar. My taste buds also pick up on the biscuit bread, farmhouse hay/fruitiness that are in more traditional saisons, but these are riding shotgun, as the main driver for me is the sugar and malts. Definitely complex, and different. The body was a medium thickness with a mouthfeel that was crisp with a dry finish. Heavy on the carbonation. The high ABV is masked pretty well with this one. Overall, I was pleased with this beer, and I am happy to see progress with Naughty Brewing. I know right now the beers are contract brewed out of Adelbert’s, but one day Naughty will see a home in my town of San Antonio. In my opinion, this was a good release to introduce the brand to. It is a unique twist on the saison style. Metal Connection: To be honest with you, this one was a hard for me. I wanted to pair this beer with a unique song that had the word “moon” in the title, and seeing that there are many songs with this word it took me forever to find the perfect match. 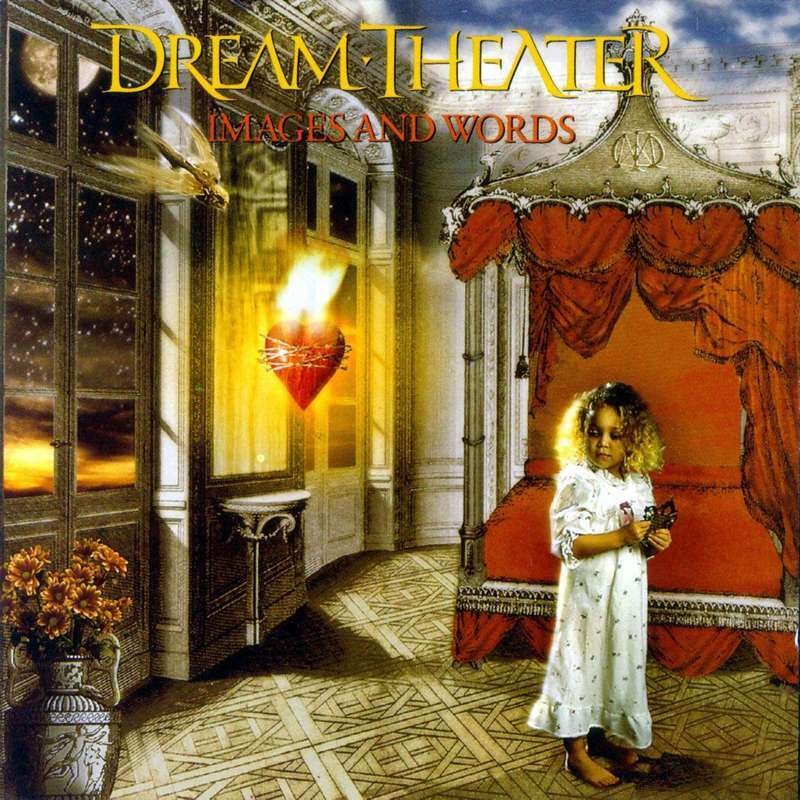 Once I narrowed it down, “Under a Glass Moon” by the one and only Dream Theater was the winner for this Metal Connection. This song comes to us from their 1992 breakthrough sophomore full length album, Images and Words on Atco Records. My first encounter with this band was through the infamous Headbanger’s Ball on the old Mtv format when they showed the music video for their single, “Pull me Under.” The music was heavy, technical, powerful, melodic, and I was an instant fan. Let’s seem in 1992, I was also still in High School and going through the phase of Metal or nothing! I actually thought it was very cool of vocalist, James LaBrie to be wearing a Napalm Death shirt during the stage shots in this music video. Enjoy this 7 minute epic song full of powerful music and dream-like lyrics! Their newest beer Jizden Kousen, a Belgian IPA is out now if ya want it!